Super easy one today! Amazon has this fabulous auto decal that I need for my Durango. It's only 4x4, so I wish it was larger, but I suppose it'll have to do. I love sloths, and I'm way to worn out by evening to consider partying, so it's pretty darn accurate. I wish I could see if it's actually black and white, or parts of it are clear. That could be complicated since my vehicle is black, but I'm sure we'll figure out something to make it work. Super cute. I love Amazon! Ha Ha! I think I need this too! Oh gosh, this would be my dream day! LOL. With two little kiddos, sleep is something that doesn't happen much. I need to get this for my husband - haha! He's the king of napping. 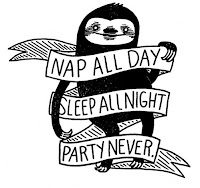 I'm not a big napper, I prefer to save it for actual bedtime. I'm not a fan of stickers on cars but this is cute.